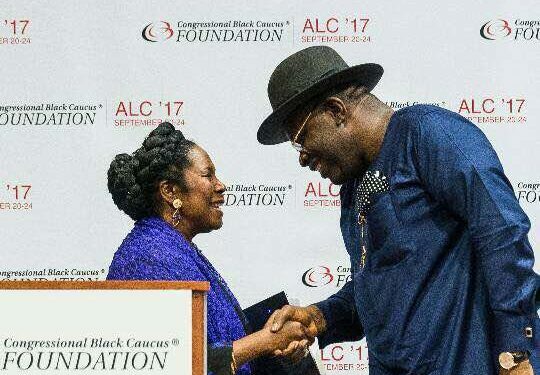 Chairperson of the Congressional Black Caucus Foundation, Rep Sheila Jackson Lee, has commended the Bayelsa State Governor, Hon. Henry Seriake Dickson, for placing the state on the path of development, prosperity and peace. While commending Governor Dickson for his developmental strides in a difficult and treacherous terrain, Rep Lee said the Restoration Government has well articulated policies and programmes, which if religiously implemented, could take the state from the backwaters. Lee who is the Texas 18th Congressional District Representative spoke on Friday, September, 22 at the interactive session with the governor at the Foundation Convention Centre in Washington DC. A press statement signed by the governor’s Chief Press Secretary, Francis Ottah Agbo, said the Texas 18th Congressional District Representative also called on investors to do more especially in African countries, stressing that Africa needs the support of the Western world to develop. In his response, Governor Dickson called for global support to tackle environmental pollution and the fight against terrorism. The governor also urged the international community to heed President Muhammadu Buhari’s call for global collaboration against terrorism. Dickson, who was also a parliamentarian, said Bayelsa is the safest and most stable state in the Niger Delta region, declaring that both Bayelsa and Nigeria in its entirety are safe haven for investments. He said his administration has created a conducive environment for investments to thrive and assured investors of high return on investments (ROI) in the state.